Can a State IQA Replace Signature Petitions even though State problems are different from the U.S. government problems? State IQA (SIQA) could solve many problems with the signature-petition initiative process currently experienced by the States. NAVIGATION: Home » Frequently Asked Questions (FAQ) » Can a State IQA Replace Signature Petitions? Can a State IQA Replace Signature Petitions? Special interests groups increasingly usurp the state initiative process. Often, there is no quality control of State initiatives other than to ensure that they comply with the law. Generally, signature gatherers present only pro-initiative information thereby misleading signers. There is no feedback mechanism for Citizens to influence the wording of an initiative. The State incurs large costs to verify signatures. The number of initiatives can be excessive and overwhelm the voters. Initiative’s text, title and slogans often confuse and mislead voters. Inappropriate initiatives often waste voters’ time. Opinions distributed to voters often present a one-sided perspective. Replacing signature petitions with an IQA (i.e., Citizens’ Initiatives Assembly) almost entirely precludes these problems. The planned IQA solution in this web site should prove helpful to States as a reference in developing a SIQA Legislative Referendum. Unfortunately, the SIQA approach does not scale down proportionally from the U.S. population to a State population. However, the shorter distances in a State should permit SIQA members the convenience to meet on weekends rather than weekdays. Larger States should find the cost of a SIQA to be entirely acceptable. Any of the States could implement a SIQA by constitutional referendum. Alternatively, voters in the 16 States permitting direct constitutional initiatives could propose a SIQA to replace state signature petitions. This will benefit the States, probably expanding from the initial states to other states and large cities. It will also advance this Amendment by increasing familiarity and confidence in the Solution’s nationwide implementation. Three States, Oregon, Colorado, and Arizona, are in various stages of moving in this direction by use of Citizens’ Initiative Review Commissions. Theoretically, any State could use the IQA process instead of its signature petition process for qualifying initiatives. Unfortunately, the size of an IQA needed to create equal accuracy representation of the people’s views does not change above about 100,000 voters. In other words, the IQA’s total annual cost is roughly the same for the U.S. with a population of over 300 Million or the State of Wyoming with just over 500 Thousand. An alternative is to accept a lower representation accuracy to keep the costs down. This shown in the chart below, where the accuracy is statistically called the Confidence Interval – the tighter the interval the higher the accuracy. As a reference point at the high end of the graph, a sample size of 1,070 randomly selected registered voters give a nationwide poll a theoretical ability to predict the opinion of the nation to ± (plus or minus) three percent in 19 out of 20 polls. However, telephone pollsters usually gather the data. A significant proportion of the polling sample normally decline to participate. Expert statisticians replace those who decline to participate with people who have similar socio-economic-age-race backgrounds. This reduces the polling accuracy to a degree dependent on how well the experts select the replacements. The size of this sample (over 1,000) is greater than the size of a national assembly and beyond the feasible range for an IQA. The Athenian example is the smallest, with at most about 45,000 citizens eligible to vote—i.e., excluding women, slaves, non-citizens and non-adults from the total population. 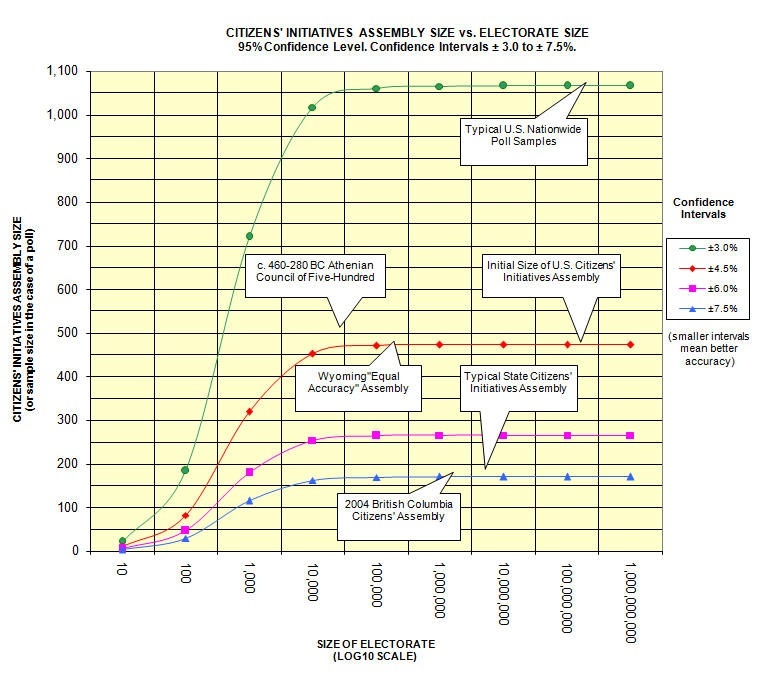 Their 500-member Citizens’ Assembly (they called it the “Council of Five-Hundred” or “IQA“) would give them a confidence interval of about ± 4.35 percent in predicting what the citizens wanted to vote on—assuming that their random selection by lot was good, which it probably was not by today’s standards. The cost of a 500-voter IQA would be very high in a modern developed society of this size. Reduce the standard of accuracy for the cross-section from ± 4.5% to perhaps ± 7.5% by using only a 150 to 180 person IQA. Reduce the maximum number of Initiatives to less than those at the U.S. level. Reduce the IQA meeting length to two-day weekend meetings—taking advantage of shorter travel times compared to a nationwide system and minimizing members’ work disruption. Take two or more votes on a Candidate Initiative with different IQA membership several months to a year apart to increase the accuracy—i.e., improving the confidence interval while keeping a smaller IQA size. Hypothetically, adding the confidence interval to the IQA passing-vote percentage can offset the reduced accuracy of representation. For example, if the confidence interval were ± 8%, the IQA vote to pass a candidate initiative would be a supermajority of 58 percent. On the other hand, this supermajority requirement could hamstring the IQA into inaction on important issues. Moreover, it departs from the fundamental idea of majority rule for issues not affecting constitutional issues and, in particular, individual rights. Consequently, the rules of the IQA (i.e., U.S. Citizens’ Initiative Assembly) do not incorporate this idea. Instead, a Candidate Initiative requires two separate passing votes. At a nationwide level, the approach is very cost effective. Costs for a typical state are reasonable. However, in the least populated states, costs are rather high. On the other hand, the ancient Athenians were willing to pay dearly to protect their rights. A “rules of thumb” is apparent from this chart. 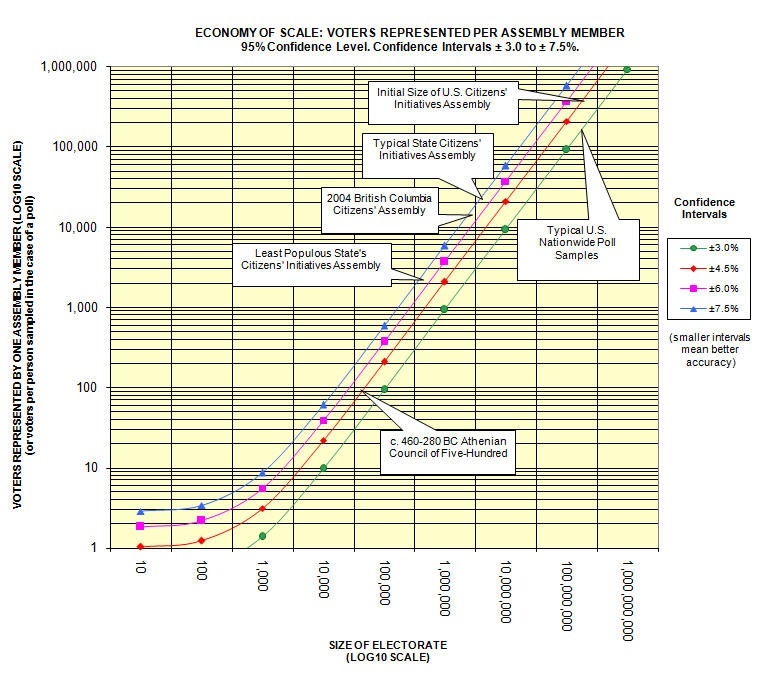 If the electorate’s size doubles, the IQA cost per voter decreases to half. The reverse is also true. Each State and large City will have its own views on the use of Citizens’ Initiatives Assemblies. They differ greatly in population, geography, political philosophy, constitution, and laws. Each one will generally have its own unique design requirements. These are beyond the scope of this web site and need addressing independently to avoid confusion. The information on this web site should provide a useful reference point. If one of them adopts an IQA to replace their signature petition system, if only for a trial, this will provide valuable confirmation and impetus for the planned nationwide system. Some may argue that the focus should be starting a demonstration of the IQA before starting the Citizens’ Initiatives Amendment process. There is logical merit to this view. However, the impetus to conduct the demonstration is not currently in place. Starting the Amendment process in a few states first will generate the political impetus to start the demonstration. 1. Annual costs per capita are calculated assuming the IQA has about 180 Members and an annual cost of $20,000,000. In all of these states and cities, the decision to replace their signature petitions with an IQA can be made by initiative or referendum.